(Nanowerk Spotlight) The refractive index is the property of a material that changes the speed of light and describes how light propagates through the material. The refractive index is an important property of solar cells – the higher it is, the more incident light gets reflected and is not converted to a photocurrent. Air, for instance, has a low refractive index very close to 1.0; but silicon, still the most common material used in today's commercial solar cells, has a high refractive index which causes more than 30% of incident light to be reflected back from the surface of the silicon crystals. Solar cell manufacturers have therefore developed various kinds of antireflection coatings to reduce the unwanted reflective losses (read more in our Nanowerk Spotlight: "Moth eyes inspire self-cleaning antireflection nanotechnology coatings"). The purpose of these optical thin-films is to minimize the differences in the refractive indices between the ambient medium and the solar cells (or other optoelectronic devices). "For both solar cells and LEDs, coating with nanoparticles can enhance the performance without harming the electrical properties of the devices, as can occur with etching or lithographic processing," Hsuen-Li Chen, a professor in the Department of Materials Science and Engineering at National Taiwan University, tells Nanowerk. In new work, reported in the October 16, 2012 online edition of Advanced Functional Materials ("Nanoparticle Stacks with Graded Refractive Indices Enhance the Omnidirectional Light Harvesting of Solar Cells and the Light Extraction of Light-Emitting Diodes"), Chen and his team have not only demonstrated this advantageous feature but also provided a strategy for optimizing the types and sizes of nanoparticles for use in both solar cells and LEDs. "Previous research did not mainly focus on the refractive indices of nanoparticles" says Chen. "Therefore, we wanted to know how these nanoparticles behave if they were spin-coated onto substrates. We assumed that nanoparticle stacks can be seen as optical thin films with refractive indices because of their little roughness and we successfully used both simulation and experimental measurement to prove our hypothesis." The team's main motivation has been to develop an easy and inexpensive method to construct optical thin films. Traditionally, multi-layer optical thin-films with graded refractive indices were fabricated by PVD (physical vapor deposition) or CVD (chemical vapor deposition). However, using vacuum systems is both time consuming and expensive. 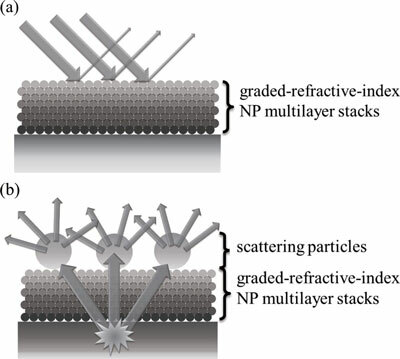 In order to save money and processing time, Chen's team therefore decided to spin-coat dielectric nanoparticle stacks with suitable refractive index to fabricate graded refractive indices multi-layers. "Our assumption was that, if the sizes of the nanoparticles are far less than the wavelength,they can be treated as optical thin films with effective refractive indices after they have been spin-coated onto the substrate," Chen explains. "Our rapid, low-cost, solution-based method allows the construction of graded-refractive-index nanoparticle stacks that function as broadband, omnidirectional antireflection coatings. This technique can minimize the reflectance of the silicon-air interface and increase the efficiency of silicon solar cells." "Moreover" he says, "if the sizes of the particles were to be close to the wavelength of incident light, these particles will behave as scattering centers, changing the direction of incident light and roughening the surface. Different optoelectronic devices require different surface morphologies; some need a flat surface to avoid scattering and retain their electrical properties, while others need a moderately rough surface to enhance the light extraction or increase the optical path through a scattering effect." Therefore, in their experiments, the researchers prepared both types of system readily through the selection of the types and size of the nanoparticles and their subsequent spincoating onto the substrates. Chen points out that the thickness of each spin-coated layer is critical and can be controlled by the rotational speed. "However, it took time to optimize them because we constructed multi-layers. The interference between individual layers as well as the solvent we chose would influence the thickness and roughness significantly. Fortunately, we were able to overcome these problems." Because spin-coating is a rapid and cheap process, the main issue in this work was to choose nanoparticles with suitable refractive indices. As long the refractive indices of the materials of optoelectronic devices are known, it is not difficult to coat nanoparticle stacks onto them to reduce the interfacial reflectance. The result of the team's study is a novel strategy for arranging dielectric nanoparticles of various types and sizes to enhance both the omnidirectional light harvesting of solar cells and the light extraction of LEDs; and because the fabrication approach involves rapid and simple spin-coating and does not require any etching, the electrical properties of the devices will remain unimpaired. "The underlying strategy of our process is to match the optical constants while considering the effects of scattering under different wavelengths," Chen sums up the study. "We are convinced that our nanoparticle-based technique has great potential for application to other optoelectronic devices, including thin-film solar cells, organic solar cells, transparent conductors, and OLEDs."